A tree has bloomed on a city block outside a house for many years. Inside that house, several generations of a family have grown up. Grandma and Grandpa arrived at the house from a country far away, and Mom and her brothers played on the steps on warm summer days. This little girl learned how to walk on that street, too. 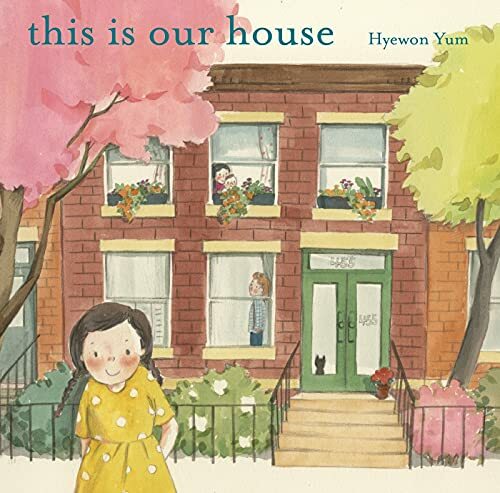 Hyewon Yum's This is Our House is a warm story with spare text that follows a family through seasons and generations, from the early days of immigration to the times that made their house into a home. Hyewon Yum is the critically acclaimed author of several previous picture books. Of The Twins' Blanket, Publishers Weekly said in a starred review that "Yum's third picture book shows the author/illustrator thoroughly at home with the picture book form." She studied painting and printmaking at Seoul National University in South Korea. She received her master of fine arts at the School of Visual Arts in New York City and presently lives in Brooklyn, New York.